Trying to manage an entire business on your own is not an easy task at all. When you have a business partner both of you can share responsibility and get the work done faster as well as in a more effective manner. This having been said, choosing business partners is not an easy task at all. One wrong decision in this regard could really ruin your business and be a source of immense stress to you. 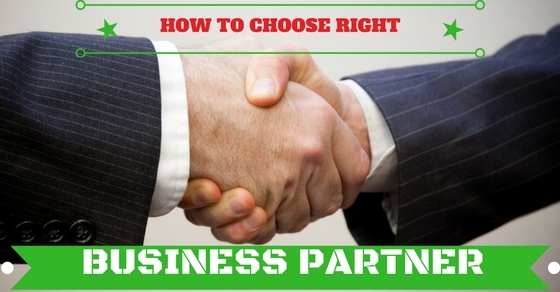 Given here are some of the main ways on how to choose right business partner so that your business is able to become very successful over time. Before you just head out on a wild goose chase, it is important that you start at the right place. The first thing which you need to do when you want to choose a business partner for yourself is to decide upon whether you want a business partner from among your family and friends circle or whether you are actually looking to hire someone who is completely unknown to you. Doing either of the two things has its own pros as well as cons. Choosing someone who is a friend is good in the manner in which you will already be well acquainted with the individual , however be prepared for the fact that if things on the professional front don’t work out, you mind end up losing a friend. Finding a business partner is not going to be an easy task, yet if you find yourself a good partner, it could really be huge boon to your business. One of the first things which you need to do, is start interviewing as many people as you can. Once you have already made a list of the few things which you are on a look out for, then you can really start evaluating a proper as well as informed manner. This having been said ensure that you do not have too many limitations otherwise you will never be able to find someone who can serve as your partner in the business. Rather than confusing yourself too much, you should really narrow down on a few likely candidates. The fewer the candidates, the better it will be for you. Believe it or not there is no such thing as a perfect business partner. It is only when both of you know each other better that you will understand each other better. Things might seem a little tough and even complicated at the onset. However over time things will probably improve. Always take any business related steps carefully, but ensure that you are not over thinking things in the attempt of trying to find that one perfect business partner. Choosing a random stranger to a business partner with you is a very silly thing to do. Prior to breaking to the individual that he has been selected to the post, ensure that both of you’ll have spent some quality time together. Business partners spend a lot of time together so you must ensure that you are compatible with the person who you select. A person’s credentials might be very good on paper, but he may not be able to deliver in person. So ensure that you do take the time out of your busy schedule to get to know the person better. If possible even go on a business trip together. Just because an individual has a good personality that does not mean that he has a clean slate. In the business world there are many people who put on a very professional exterior but in reality they are very crooked and untrustworthy. So make it a point to ensure that the person who you are selecting as a business partner is not someone who has a history of being a crook or a swindler. If the person has a shady past it is likely that he being associated with your company is going to tarnish the company name. Once a company is seen in a negative light no one will want to invest their money in your products or services. When choosing business partners, many people do not take into consideration the importance of choosing someone who is fit and fine. It is advisable that you do choose someone who is more or less your age so that the age gap does not become a source of complication and that both of you are on the same wave length. Ensure that the person you are likely to choose, is not someone who has a history of heart disease or is prone to things like depression. If the business partner is unhealthy then he will not be able to contribute to the business in a positive way and the responsibility of getting things done will fall on you alone. At the very onset you should make it a point to take a note of the differences between the two of you. One of the worst mistakes you can make is trying to opt for a person who is exactly the same as you. A little difference goes a long way in ensuring that both of you form the complete package. A worker, who might be finding it hard to talk to you, might find it easier to talk to your partner. So ensure that you are keeping a broad mind when choosing business partners. The moment you start limiting yourself, things are bound to become rather complicated for you. Once you think that you have found someone who is your partner, ensure that you get things clear right at the very onset. Place your terms on the table and clarify whether or not the other person is in agreement with what you are saying or not. If the person at this early stage is in disagreement then it is better that you both part ways rather than having a very complex situation to deal with in the future. There should be a great deal of clarity between the two of you; otherwise your company will never be successful in the future. The person might be able to talk and communicate well, but ensure that the individual has the qualifications to back him up. If an individual has no theoretical knowledge then he will be unable to put his knowledge into practice. This having been said, ensure that you are not only on the lookout for someone who just has a number of qualifications. As many qualifications do not guarantee that a person will be able to do the job well and in a proper manner. Your aim should be finding the right partner who has a good personality and sound theoretical knowledge. Make it a point to ensure that the strategic partner who you choose is someone who loves challenges and does not back down when things are tough. There are many people who work well, but the moment things get a little tough, they immediately crumble under pressure. Ensure that you do not choose someone who is very weak minded and easily influenced by what others are saying. If you choose someone who is incapable that defeats the very purpose of having a business partner. Things in the business world are never easy and almost every day is a challenge so ensure that you choose someone who is always willing to take up a challenge. A very thing to do when you choosing a partner is, choose someone who has the skills which you are lacking in. This ensures that both of you will really complement each other as partners. The more skills both of you have as a pair the better things will be for the both of you. One individual cannot possibly have all the skills required to run the business successfully. Yet ensure that the person concerned does have the necessary soft skills and communicative skills required to be a good and able leader. In addition to this leadership skills are simply indispensable. It is very important that you choose someone who has the same goals as you have. When both of you have different goals in mind then you’ll will never be on the same page. Having someone who dreams big and is ambitious is very important indeed. If you choose a partner who does not dream big and who always is very negative in his approach then your business will never be able to take off. It takes a dreamer to make a business successful. People who have small dreams are never successful entrepreneurs. One of the biggest mistakes you can make when choosing a partner is choosing someone who is very selfish and looking to make himself a success in life. You must make it a point to hire someone who is very committed to the company and is willing to sacrifice his personal gains in order to get the business functioning smoothly. If the person you choose is very selfish and fails to let you know things he is doing or plans he is making, then that is going to be very problematic. To make the agreement proper, rather than immediately hiring the person to be your business partner, choose someone on a temporary basis and see how things work out. If after this brief trial period you find that things are working out well, then you can make things official. It is of paramount importance that you choose someone who will stand by you at all points in time as that is what a partner should be doing. Never choose a partner who has a mind of his own and will be unwilling to take criticism from you. Finally, it is very important that you choose someone who is not a quitter and is willing to make some sacrifices for the company. In the first few years both of you must be prepared to make sacrifices. Successful businesses do not come up in one day, it takes hard work and consistent effort. So do not choose someone who is bound to quit the moment things get tough. As mentioned above it is important choosing a person who loves to take up a challenge, but beyond that you must choose someone who is willing to take a calculated risk, when it is necessary to do so. These are some of the main points which you ought to keep in mind when you are trying to finding a business partner. Believe it or not this decision can really make or break your business. The points given above are some of the main things which you need to keep in mind. When taking this decision of choosing business partners ensure that you are putting a lot of thought into your decision and that you are not letting any third person influence your thought process. Just follow your own heart and do what you think is best for both you as well as your precious business.